Now that another week of QRL is gone and the weekend is here maybe it’s time to sum up my this year’s WWDX CW contest entry between packing moving boxes. 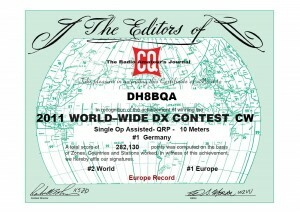 😉 Condx were excellent so my choice of band had to be 10 m, of course. As a reader of this blog you know I’m an absolute 10 m addict, even in sunspot minimum. Back in 2011 when we built our big 6 ele OWA Yagi I took part in the (then still new) SOSB10 QRP (A) category aiming for the world record. Sorrily SU/HA3JB had decided to do the same thus it was “only” 2nd place world and a new European record (see left). That did indeed hold for 3 years but is going over to EA4KR now as per the preliminary results. Congrats Julio! This year I was running HP (A) and had a really great time! Last year I made almost 1.400 QSOs with the same setup and quite nice condx and didn’t think I would ever be able to do much more. Condx are winter-typical at the end of November compared to WWDX-SSB in October meaning about 2-3 hours less time when the band is open. That is cutting down QSO totals, of course. Another “problem” that arises from the later time in year is there is no common window with zone 1 (KL7) anymore, likewise for zone 31 (KH6) on shortpath. Even with great conditions the band simply closes an hour too early overhere (and opens an hour to late overthere). Thus if all goes well only 38 zones are workable. Z31 could be worked as number 39 via longpath but I had no luck this time. Last year certainly nobody would have thought of propagation still being as good as it was now, yours truly included! 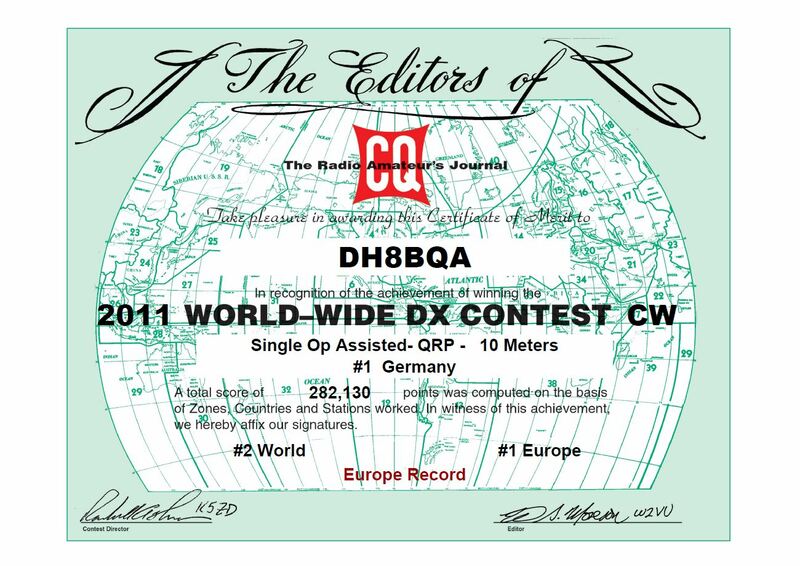 After the SSB leg I’m sure almost everybody was hoping for similar condx in the CW leg and keeping all fingers crossed they had, yours truly included! And yes, we were indeed lucky! 😉 I went to bed Saturday evening with 1.030 QSOs, 148 DXCCs and 38 CQ zones worked. That’s been a plus of 300 QSOs compared to last year. Wow! So here’s the final result. As usual I put a detailed SH5 analysis online, too.